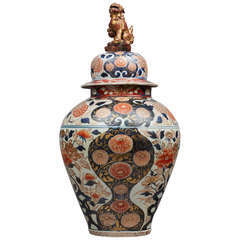 Unique large contemporary Japanese decorative hand painted Imari porcelain vase in a stunningly shaped ovoid, a signed masterpiece by an acclaimed, award-winning master porcelain artist in polychrome overglazed enameling. This artist has perfected this technique to create porcelain with stunning colors and flowers coming alive. 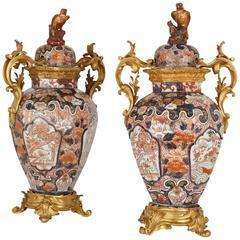 His signature style is a refreshing interpretation of traditional polychrome enamels decorating porcelain over clear glaze. With his strong fascination with nature he creates a dramatic landscape on porcelain over clear glaze. This artist's painstaking “drip painting” technique is designed to bring a subtly raised feel to flowers expressed in bold vibrant colors with flowers coming alive. This artist's profile is available upon request. This exceptional piece depicts a bird flying around pomegranate tree with peonies in pink, orange and white flower on the background., with a variety of seasonal flowers decorating the body, on pure white background, characteristic of Arita fine porcelain. The area around the rim is decorated with an intricate honeycomb pattern in iron-red. 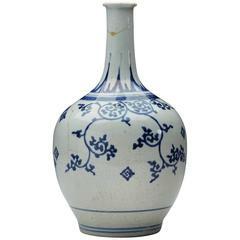 The base has a delicate leaf and petal pattern in deep blue and green. 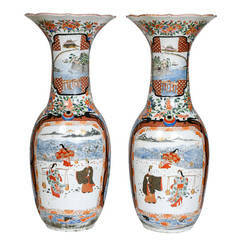 This stunning hand painted decorative vase comes in a custom made wooden case signed by the artist. Dimensions: H 13 in, D 12 in.